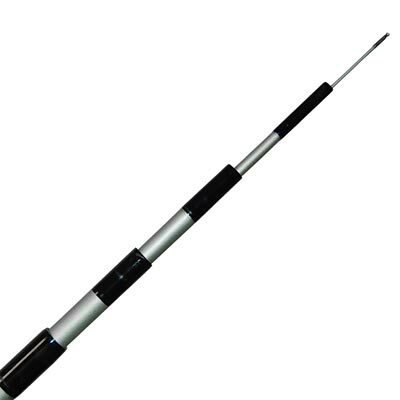 Perfectly display your existing Jackite kite on the Jackite Platinum Fiberglass Telescoping Kite Pole. This durable yet lightweight pole is perfect for banners and kites, and its muted silver color brings a fun look to the area. The fiberglass body has 6 sections which, when fully extended, can reach up to 26' for a wonderful display. Each section locks into place to prevent slipping, and the item may be condensed to 59.5" long for convenient storage. The round pole can easily be installed into soil using an anchor (not included), or be fastened to a fence post or other vertical pole for stability. Its unique construction allows the item to flex in the wind, for added drama, and a metal winder clip keeps your line rigging secure when not in use. Showcase your kite or banner easily with this Platinum Fiberglass Telescoping Kite Pole. Ninety day limited warranty.